Kauai can be an expensive island to visit. Thankfully, saving a buck or two doesn’t mean you have to skimp on quality when it comes to mealtime. Since we’re such foodies, we can’t pass up the opportunity to try different foods wherever we are. We’re especially keen on restaurants that deliver quality and that don’t break the bank. It’s not always easy! We focus on getting lots of recommendations from locals and past visitors, and we routinely try out joints that grab our attention as we’re roaming around. Since most visits to Kauai are full of activities, it’s helpful to hit dining spots that place a premium on feeding you well and getting you back on the road as you’re racing from the beach to the mountains. Here are some suggestions for delicious quick eats (including dessert!). Viewfinder Tip: Always save room for shave ice when on Kauai. Many people told us to stop by Brick Oven Pizza for their all-you-can-eat special. One evening, we broke up a drive across the island to our hotel by stopping in to check it out. Set up like a buffet, the selections were impressive. Craving some greens, we relished all of the salad options. We also sampled the different pizzas (and even pastas) on display. Try the margherita; topped with garlic butter sauce, it’s mouthwatering. If you’re traveling to Kauai with kids, this place is for you. Everyone will leave happy, and your wallet will be left intact. A friend told us to try Java Kai for a quick cup of coffee and a bite to eat. We especially enjoyed this joe shop because it has the feel of a coffee joint back in Seattle. Plus, during the time we hung out, we felt a significant local presence – always a good sign. We had a killer breakfast burrito with pesto, along with a basic sandwich. Both were tasty, but the real highlight was the Aloha Bar, loaded with chocolate, coconut, and other goodness. Note: the entire dessert case at Java Kai looked tempting. The meal that really got us, though, was next door at Mermaids, a place that a couple of locals pointed us to. We knew it would be good when we walked up and saw them cooking up meals to order with fresh, nutritious ingredients. We had a tough time deciding what to go with but decided on tofu, coconut curry, and an avocado focaccia sandwich with pesto aioli. The curry dish was yellow and mild, loaded with veggies. The sandwich – prepared with just a few prime ingredients – packed a huge punch. Now on to dessert! We’d been to the Hawaiian Islands a few times and had never had shave ice, which – many people would say – is like not having been to Hawaii at all. Realizing we had to get our act together, we devoured our first shave ice on the island of Kauai and, now having sampled a lot across the islands, believe it has some of the best. First, a quick tutorial. 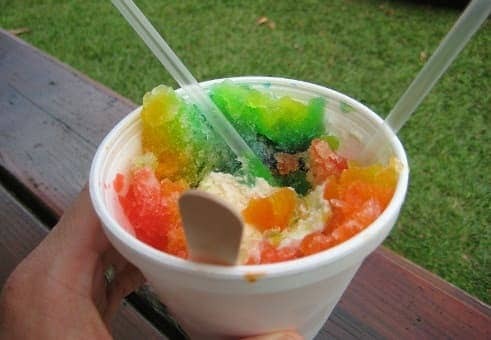 Shave ice is a powdery ice shaved from a big block and covered with tasty flavor(s). Truth be told, we jumped in that very first time only because we learned that it can be ordered with ice cream on the bottom. Seriously. Now we’re all over it! During our recent visit to Kauai, we made it a goal to decide which shop has the best. We learned that aficionados rate shave ice in terms of: ice quality, flavor, and size. Our three top experiences were at Wishing Well Shave Ice (perfect ice), Jo Jo’s (incredible flavor), and Shave Ice Paradise (huge!). Check out a few spots when you’re on Kauai and keep a scorecard. Where do you grab a quick bite on the islands?